To recap from Part One: “First, the water came up to meet us. . .
Before we traveled to Venice, we did a little research. We knew enough to ask about the acqua alta, to ask if we should pack high boots. Not to worry, we were told by our hotelier, this is not likely to be a problem while you are here. And, truly, there was no problem with the acqua alta– it came, it saw, it retreated quickly without particularly hampering our plans or wetting our socks. Our hotelier did not steer us wrong. He wasn’t counting, however, on my particular family’s foibles. And that is a long and perplexing list of foibles. 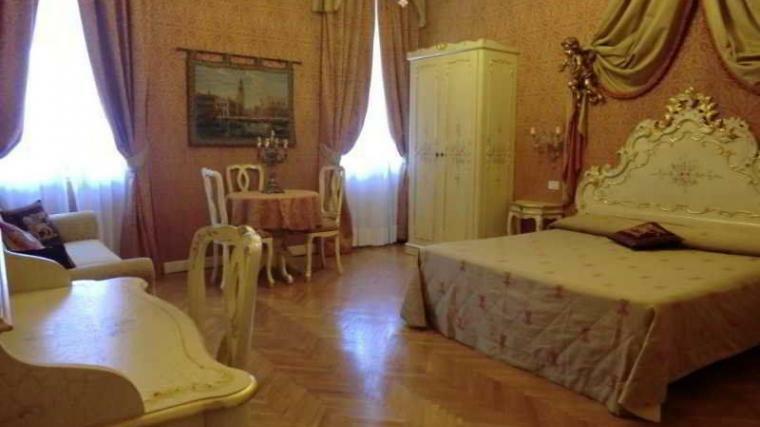 . . so before explaining our second run in (or, dive in, as it were) with the water of Venice, let me pause to tell you about our lovely hotelier and his cozy villa. 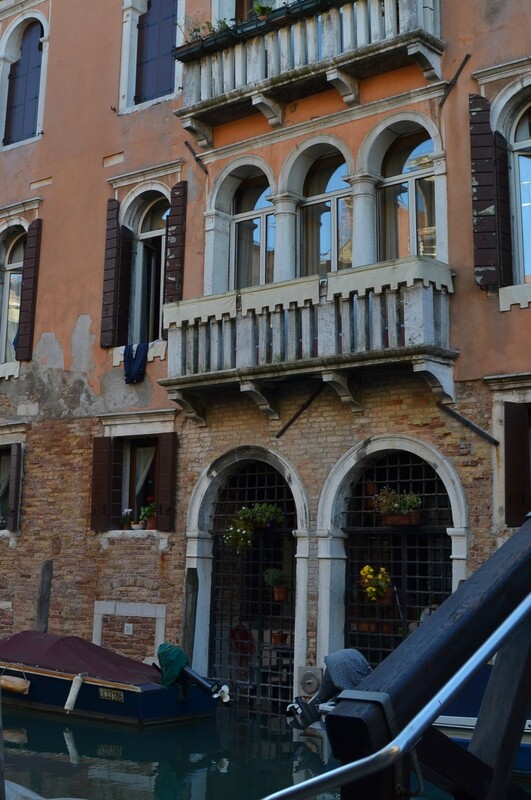 We stayed at Locanda Ca Le Vele, a charming, small hotel in an old Villa, sat right on a canal and just 3 minutes walk from the Grand Canal. The best of both worlds, then: it offered quiet charm and a convenient location. There were only six rooms/suites to the hotel, and breakfast was served in our rooms each morning. 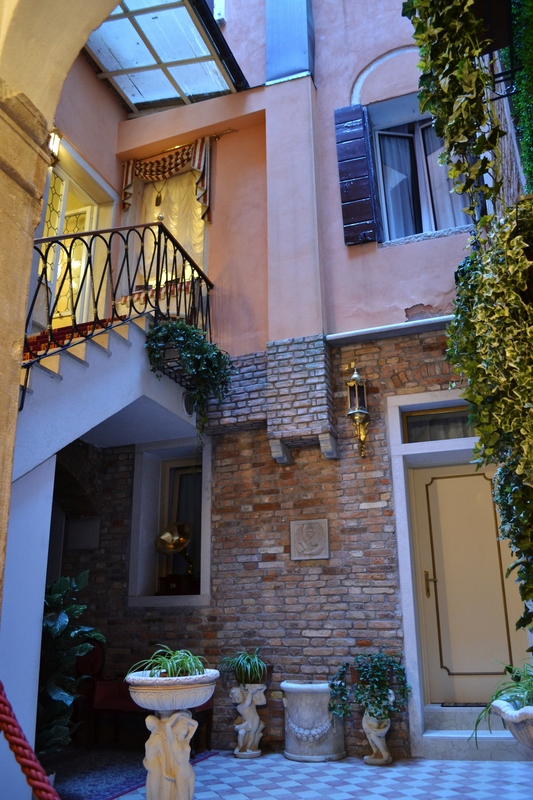 We thoroughly enjoyed the old world charm of the Villa, and would recommend it to anyone traveling to Venice. Now, whether our hotelier enjoyed our company as well, I can’t say. We were, as we generally are, quiet and respectful guests. With the exception of one incident. One hell of an incident. After a day of walking and boating around Venice, my son and I headed back to the hotel, while my husband and daughter decided to stop for coffee before walking home. They weren’t far behind us, and we’d just kicked off our shoes and gotten comfortable at home when my daughter came flying through the door to our suite in a frantic, wild-eyed state. She was bent over, gasping for breath, and trying to communicate, but the sounds she was making didn’t translate into any language known to man. In thirty seconds time, my blood pressure went through the roof . . . until she finally spit out the words, “It was the best thing that’s ever happened to me!” Followed by a barrage of laughter. A few more gasps of air later, and Kate was spilling a few details– namely that her father had fallen into the canal and was standing outside of the hotel in dire need of help and in a sorry, soggy, and silty state. Unfortunately, she left out the adjective “smelly,” because that’s what I should have prepared myself for when I went down to meet him. The silt of centuries in the Venice canals also means the stench of centuries will cling to anyone who wallows in those canals. The stairs to our suite. But I didn’t know about the stench yet, so I left my daughter, who was still doubled over with laughter, and ran down the stairs to help my soggy husband out. The stairs led to an open air courtyard and the front door of the Villa. I was moving at a fast clip, so the smell didn’t hit me until I had stopped in front of my soggy, muddy husband. (Dripping sludge from the waist down, and his face contorted in disgust, he looked less like my husband and more like the creature from the black lagoon . . .which he kind of was at this point). My senses, and sensibilities, went into overload. I wanted to burst out laughing too, but the smell–good Lord, the smell! I began retching. Violently retching. I really expected to lose my lunch as James handed me his filthy, muddy boots. But the poor desk clerk wasn’t done with us yet. My husband got into the shower, clothes and all. Having no laundry facilities, he figured he’d start with the outer layers and scrub all the way down, bit by bit, sort of like a wet archeological dig down to the original surface–and he quickly realized that the mud was so bad, he’d need extra towels to scub it away. He explained this to me at high decibels, since I wouldn’t come into the bathroom with him (have I mentioned the stench? ), but I would have to be the one to go get more towels while he continued the scrub down. Jeans hanging out of our hotel window to dry. So I went for the towels. An easy task . . .for someone who can communicate coherently . . . which I couldn’t at this moment. The hysteria that had taken over my daughter a few minutes before had now hit my son and me too, and we were all doubled over with laughter. But I did my best to request more towels. I went to the hotel desk and, between fits of laughter and gasps of breath, tried to form coherent sentences about our situation. To a man whose English was sketchy to start with. He probably thought we’d all taken a dive. . . into a barrel of wine. But he did his best for us, and handed me a large stack of newspapers. Newspapers? Well, beggars can’t be choosers and hysterical laughter doesn’t lend itself to subtle communication–so I took the newspapers and ran. The scrub down continued in our room, and, eventually, we laughed just a little less and my husband fumed just a little less, and the full story came out. They were almost back to our hotel when James decided that he wanted to see how far the water had receded from earlier in the day (when the acqua alta had spilled into the streets). So, he explained with psuedo-scientific precision, he went to the edge of the canal behind our hotel and began counting the stairs down into the canal. Apparently walking down them as he counted. Great idea. With my husband cleaned off, the room beginning to air out, and his pants hanging out of the elegant window of our room to dry, we gathered our wits and called home to family. It was the American Thanksgiving holiday, and we had plenty to be thankful for. Not least of all, that James had made such a splash in Venice and “it was the best thing that ever happened!” to my daughter. It took a few hours, but he laughs louder than anyone now. I would have been amused if it was my husband too – these things are highly entertaining!! I wondered how he had fallen in but it all makes sense now. I can just imagine that smell though…..
A most entertaining story worth reblogging! I have many blogging friends who would love to read it too. Would you give me permission? It is not uncommon to react with hysterical fits of laughter in serious situations, where one would expect quite the opposite. A wonderful tale of your life in Venice! 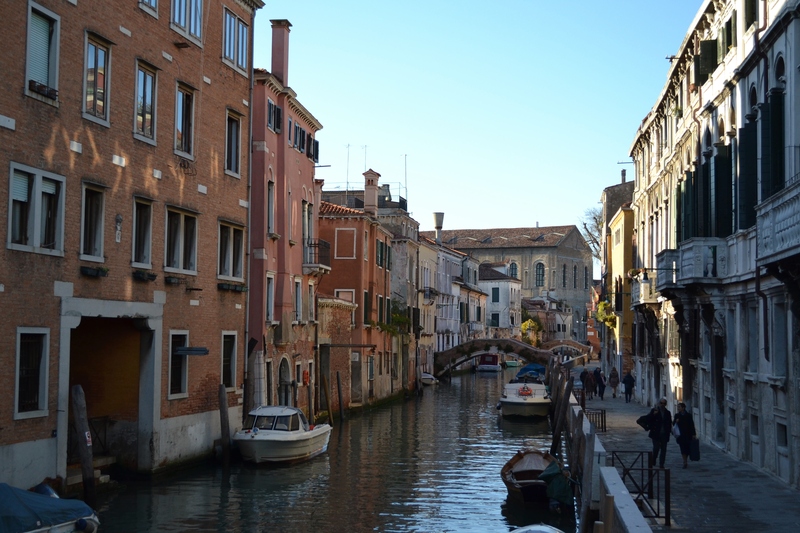 This is a great story accompanied by some amazing photos on the city of Venice. I decided to reblog it, because in our own family we had similar experiences. In a situation, by which we normally would be shocked, we break out in fits of laughter instead. Eventually even the victim begins to see the funny side of it. Enjoy! What a delightful story and glad the family saw the funny side of it. I know some families who wouldn’t have done so and would have blamed Venice for slippery steps, dirty canals, stagnant water et al. Your photographs are great too. Thanks so much. We are pretty good at laughing at ourselves–which is a lucky thing, because we bumble quite often!